11-07-2013 Tips for Avoiding Culture Shock When an individual travels to another region in the world, there are bound to be several cultural differences which can cause a traveler to experience ‘culture shock’. All travelers experience some form of culture shock but here are a few tips to make sure it is a mild case while you are away! 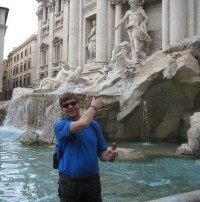 Every day about 3,000 Euro are thrown into the Trevi Fountain in Rome and collected at night to be given to a charity.